The Quartermaster Corps arranges for or provide supplies; materiel management, distribution, procurement and field services to support and sustain soldiers, units and their equipage in peace and war. The Quartermaster Corps also handles and manages individual and organizational clothing and equipment, field services including laundry and clothing exchange, fabric repair, graves registration, parachute packing, maintenance, and aerial delivery of supplies and equipment. 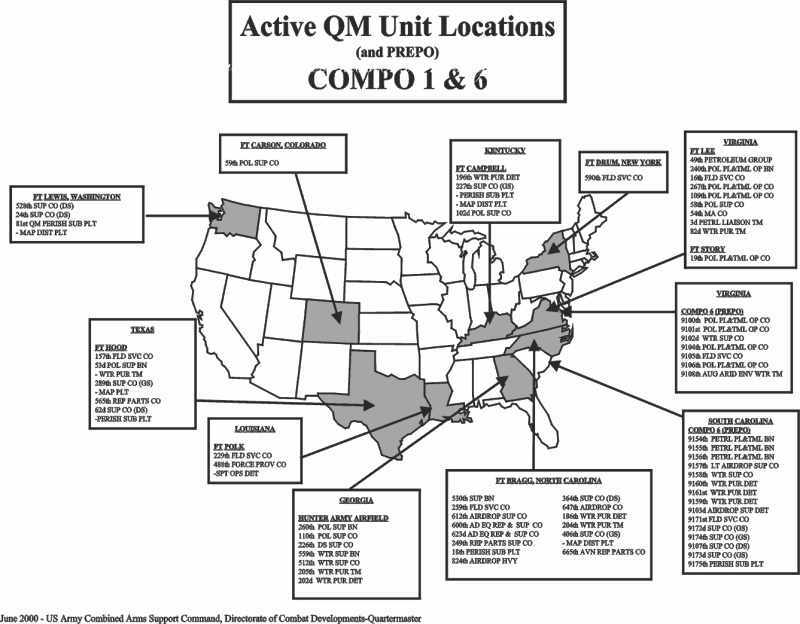 Of the 118,625 soldiers in Quartermaster units in the year 2000, 73,733 of these or 62 percent are in the Reserve Component. 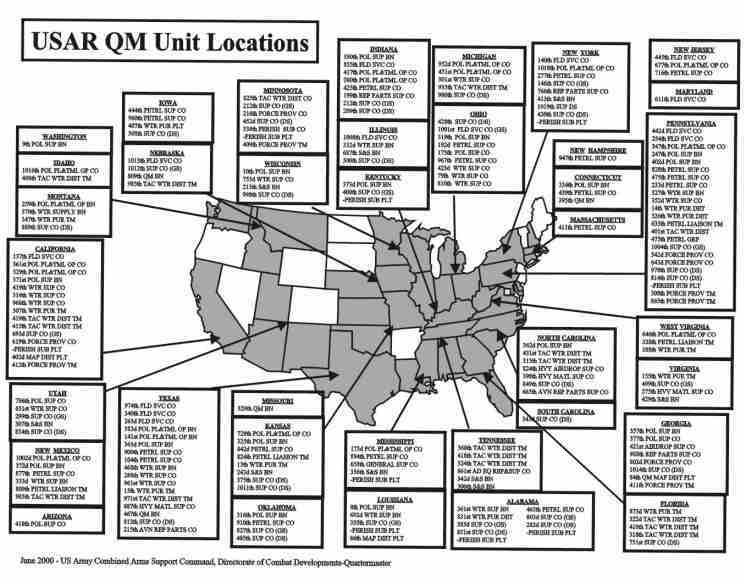 The US Army Reserve (USAR) represents 24 percent of the Quartermaster Corps - with 28,863 USAR soldiers. The Army National Guard (ARNG) represents 38 per cent of the Corps - with 44,870 ARNG Quartermasters. 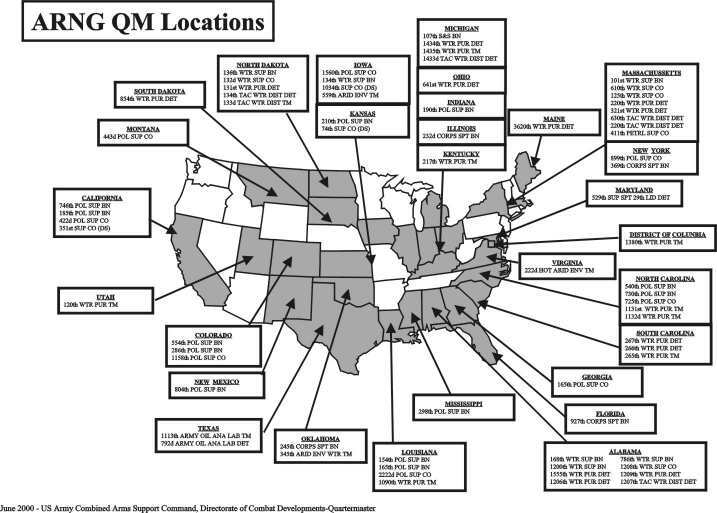 Quartermaster Corps missions have undergone enormous growth and numerous changes over the years, as supply and service functions were added or reassigned. The tradition of the Quartermaster Corps dates back to 1775 when the Second Continental Congress passed a resolution creating the Quartermaster General's Department and appointed Thomas Mifflin as the first Quartermaster General. Quartermaster duties of the Revolutionary War included; transport and supply of nearly all goods and services required by the Army and Navy. Supplies were scarce and were obtained by a variety of methods, including house-to-house canvassing. Inadequate transportation, financial problems, and other problems plagued supply personnel, but ever resourceful and courageous, they were able to overcome these problems. The Quartermaster Corps traces its origins to June 16, 1775. On that day, following General George Washington's address accepting command of the Army, the Second Continental Congress passed a resolution providing for "one Quartermaster General of the grand army and a deputy, under him, for the separate army." Major General Thomas Mifflin, the first Quartermaster General, had virtually no money and authority and was dependent upon the several states for supplies. The first Quartermaster General, General Thomas Mifflin, told Congress in 1776 that to perform his mission he would need: "200 wagons with four horses each, 50 ox teams with two oxen each; and 50 drays with, one horse each, besides 100 strong horses for the artillery, and 50 for expresses and commissary." In 1778, Congress adopted General Mifflin's plan for reorganization of the Quartermaster Department and included "a commissary of forage" and "a commissary for horses and wagons" as two of the major officials. Major General Nathanael Greene, the third Quartermaster General, reorganized the supply system after Valley Forge, establishing the first depot system to support the Army. While his fame as a battle leader is well known, General Greene's outstanding service as the Quartermaster General during the darkest period of the American Revolution has been almost forgotten. In 1812, the Quartermaster General was directed to provide means of transport for the Army and its stores. From 1818 to 1860, the Quartermaster General was Brigadier General Thomas Sidney Jesup, a daring leader and able administrator who did much to enhance the Corps' reputation. During his 42-year tenure as head of the Quartermaster Department, he instituted an improved system of property accountability and experimented with new modes of transportation, including the use of canal boats in the east and camel caravans in the desert southwest, and worked some of the earliest railroads. Because many of his policies remained in effect well into the 20th Century, Jesup is traditionally regarded as the "Father of the Quartermaster Corps." The supply of clothing and other items was taken over by the Quartermaster Department in 1842. In 1862, Quartermasters took over the duty of burying war dead and maintaining national cemeteries. Many glowing accounts have been written of the proficient services of the entire Quartermaster Department throughout the Civil War. During the Civil War, the Department under the leadership of Major General Montgomery C. Meigs supplied the Union Army of over half a million soldiers, ran the Army's first major depot system, and transported unprecedented levels of supplies and personnel throughout the war. Also, in 1862, the Quartermaster Department assumed responsibility for burial of war dead and care of national cemeteries. In 1908, Congress authorized the Remount Service, which was to procure horses, condition them, provide initial training, and issue them to using units. Before that time, horses and mules for Army use had been purchased by the Quartermaster Department under contract after advertising for bids. This practice had been quite unsatisfactory in terms of getting a number of older horses, many in poor physical condition. The first remount depot was at Fort Reno, OK. The Front Royal, VA, Depot was opened in 1911. In 1912, Congress consolidated the former Subsistence, Pay, and Quartermaster Departments in order to create the Quartermaster Corps much as we know it today - fully militarized with its own officers, soldiers and units trained to perform a host of supply and service functions on the battlefield. With this consolidation came the missions of subsistence and food service. When the Army began purchasing motorized vehicles as early as 1903, the Quartermaster Corps naturally assumed the new petroleum supply mission. During World War I, the Quartermaster Department was responsible for the Motor Transport Corps. World War I showed the increased importance of logistics in the modern era and also witnessed the first use of specialized Quartermaster units on the Western Front. Several "logistics warriors" were also singled out for valor in the Great War and received the nation's highest honors for bravery. World War I was the last major conflict in which the United States Army used horses and mules in significant numbers. The Remount Service was enlarged to meet the increased demands of the Artillery, the Cavalry and other units. About 571,000 horses and mules processed through the Remount system, and more than 68,000 of those animals were killed in that war. At the close of the World War I, the Quartermaster Corps maintained 39 remount depots with a capacity of 229,200 animals. When mobilization for World War II began in 1939, it was predicted that the Army would need 200,000 horses. In 1940, the Army had 2 horse cavalry divisions, 2 horse-drawn artillery regiments, and 2 mixed horse and motor transport regiments, with a total authorization of 16,800 horses and 3,500 mules. The need for horses continuously decreased as Active, Reserve and National Guard units converted to trucks and jeeps. These horses were returned to the remount depots. Only four horses were procured in the 1943 fiscal year and none from then on through the end of the war. Throughout the war period, only 49 horses were shipped from the United States to the armed forces overseas. During World War II, the Quartermaster Corps trained thousands of soldiers to fill specialized roles in every theater of operation - from the Pacific Isles and the China-Burma-India theater to North Africa, Italy, and central and northern Europe. They performed heroically at such far-off places as Bataan, Iwo Jima, Leyete, Salerno, Anzio, Normandy and Bastogne. The RED BALL EXPRESS became famous with the massive amount of logistics conducted during World War II. At the height of the war, Quartermasters were providing over 70,000 different supply items and more than 24 million meals each day. When it was over, they had recovered and buried nearly a quarter of a million soldiers in temporary cemeteries around the world. In World War II, 4,943 Quartermaster soldiers lost their lives. In 1950, the Quartermaster Corps moved swiftly to supply the United States military and their United Nations allies sent to defend South Korea from the Communist North. When the North Korean Communist Army invaded South Korea, the Quartermaster Corps made a successful, large-scale logistic effort under very unfavorable conditions. That same year the Corps assumed a new mission - supply by air that often proved crucial to the sustainment of troops on the Korean peninsula. From 1965 to 1973, the Quartermaster Crops was deeply involved in the massive logistical buildup required in Vietnam. The 1965 decision to commit major United States combat forces to the Republic of Vietnam led to a massive logistics buildup. Quartermaster Corps personnel were deeply involved in meeting this challenge. They could be found operating in every area of Vietnam, furnishing vital supplies and services often under the most adverse and dangerous conditions. In 1983, the Quartermaster Corps supported the fight for the island of Grenada. In 1989, during Operation Just Cause, Panama, soldiers of the Quartermaster Corps supplied and supported the victory. During Operation Desert Storm the Quartermaster Corps successfully accomplished the most complex logistical effort in military history to ensure soldiers were equipped and supplied throughout the conflict. Quartermaster officers are assigned everywhere there are soldiers and supplies. Officers accessed into the Quartermaster Corps are designated 92A- Quartermaster General. The Quartermaster Corps requires training to perform duties in a wide range of logistical areas. To prepare to meet the challenge of duty, officers attend the Quartermaster Officer Basic Course at the U.S. Army Quartermaster Center and School, Fort Lee, Virginia. The course provides training in general military subjects-leadership, military justice, weapons and tactics- and an introduction to the general functions of logistics. 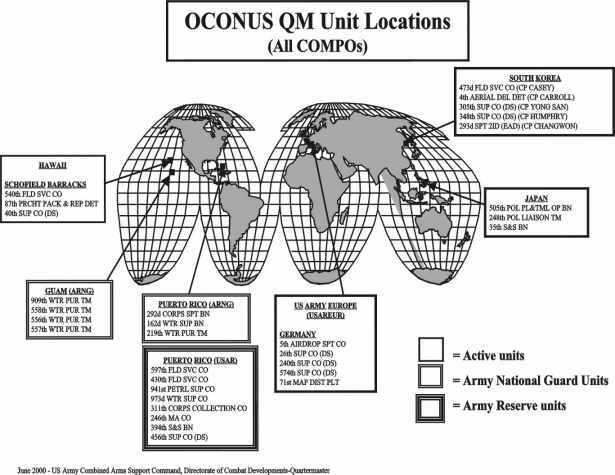 There is also will receive instruction in all of the Quartermaster areas of concentration, providing sufficient background to become a Quartermaster generalists, capable of filling any Quartermaster Lieutenant position (except aerial delivery positions). Some officers receive additional training in Aerial Delivery and Materiel and are, by regulation, the only officers who may fill parachute rigger positions. These officers, however, also retain their 92A qualification and be eligible for assignment to such a position. Upon promotion to or selection for captain, officers attend the Combined Logistics Officer Advanced Course (CLOAC) in order to prepare for Branch qualification. The CLOAC prepares officers to serve as company commanders and supply and service staff officers for multifunctional logistical organizations. During CLOAC, officers receive both advanced tactical and technical training as well as instruction in advanced materiel management and multifunctional logistics. After completing CLOAC officers are awarded Area of Concentration 92B, Supply and Materiel Management. Following CLOAC, some officers attend follow-on modules tied to their projected assignment. Others attend specialized courses relating to various Quartermaster Areas of Concentration such as the Aerial Delivery and Materiel Officer Course (92D), Advanced Fuels/Water Management (92F), or Advanced Subsistence Management (92G). Officers are required to complete the Combined Arms and Services School (CAS3) prior to their 10th year of service. After promotion to captain, officers must aggressively seek company command to enhance professional development and complement this with staff experience at the battalion, brigade, or division level.